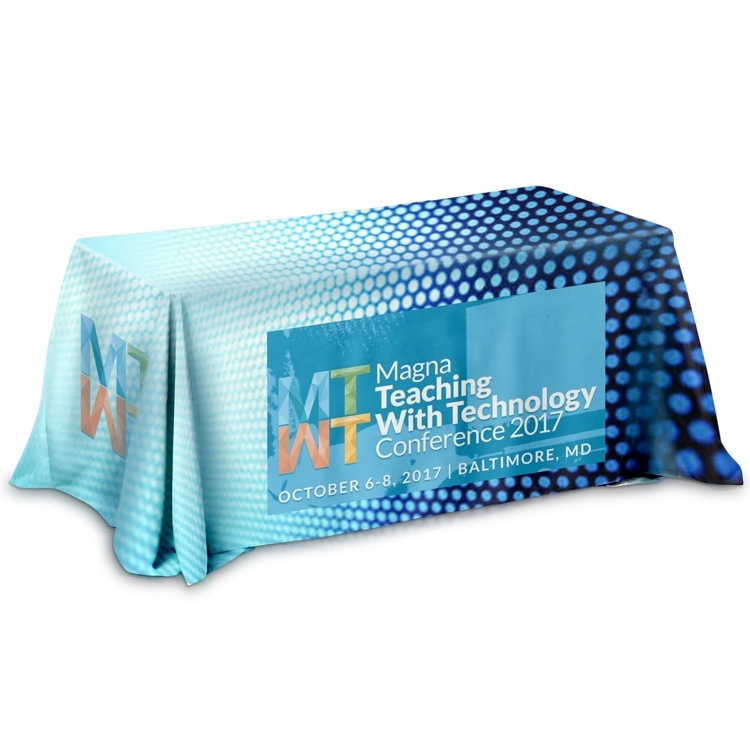 Throw Style 4-Sided Table Cover. We use only the finest quality materials for our tablecloths. 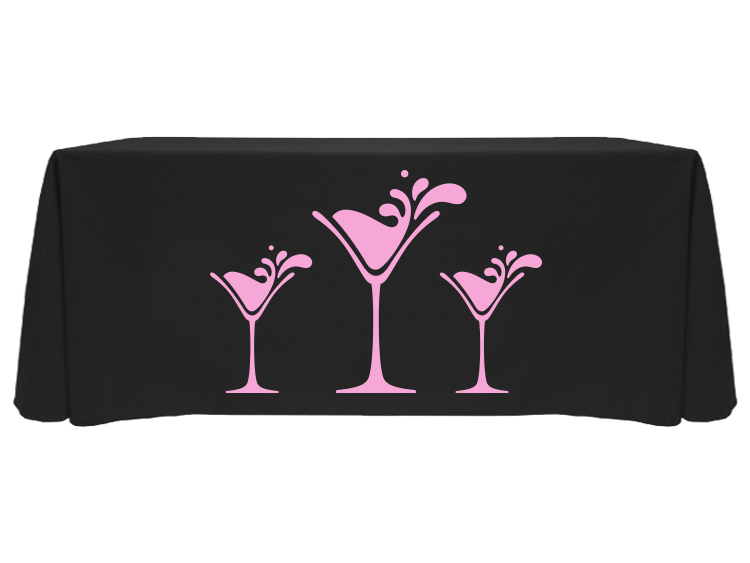 We offer both fitted and throw style table cloths. We also the largest variety of standard colors. Call today we can help! The Nexis™ Café Table Throw feature serged edges to give a finished look of elegance. 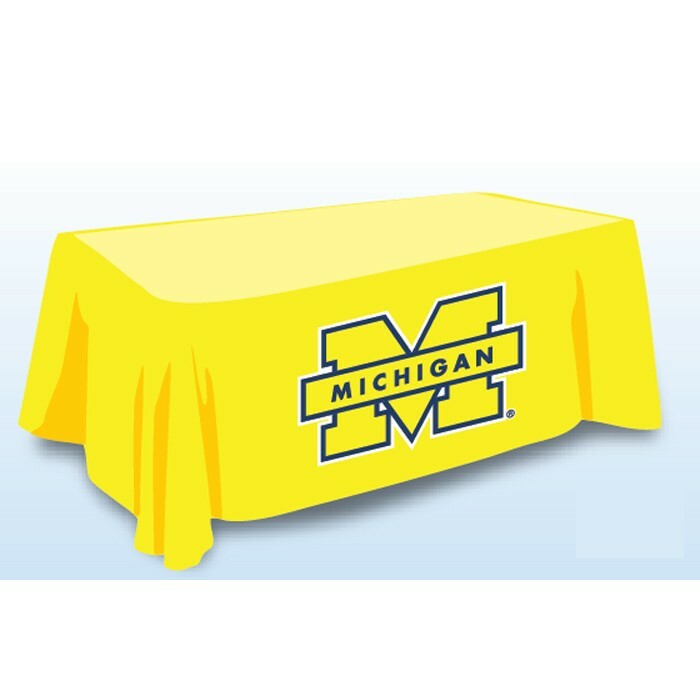 These durable, machine-washable tablecloths are made of a polyester fabric, and we are confident that these quality tablecloths may be used and washed many times before showing signs of wear. 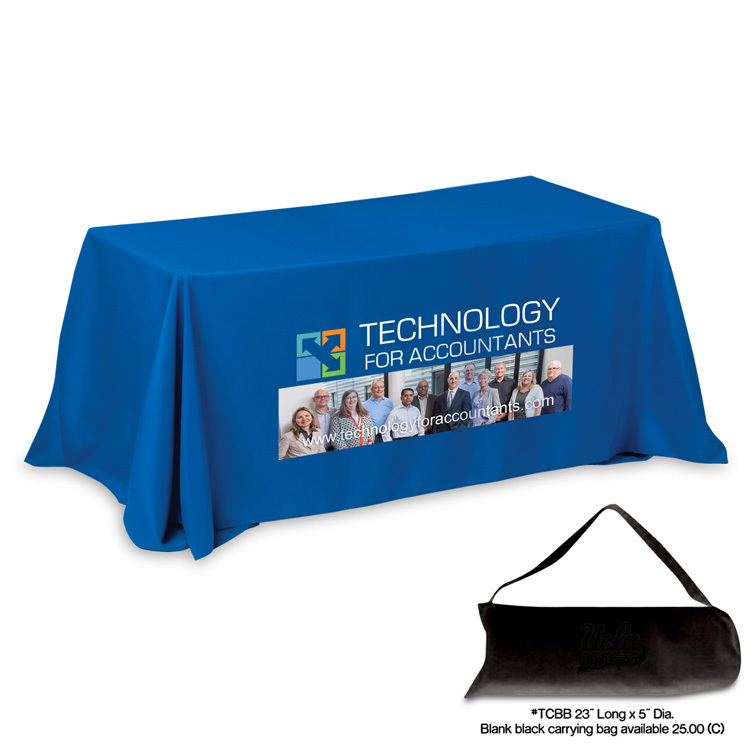 Our Nexis™ Café Table Throw is available to personalize with full-color, full-bleed graphics. 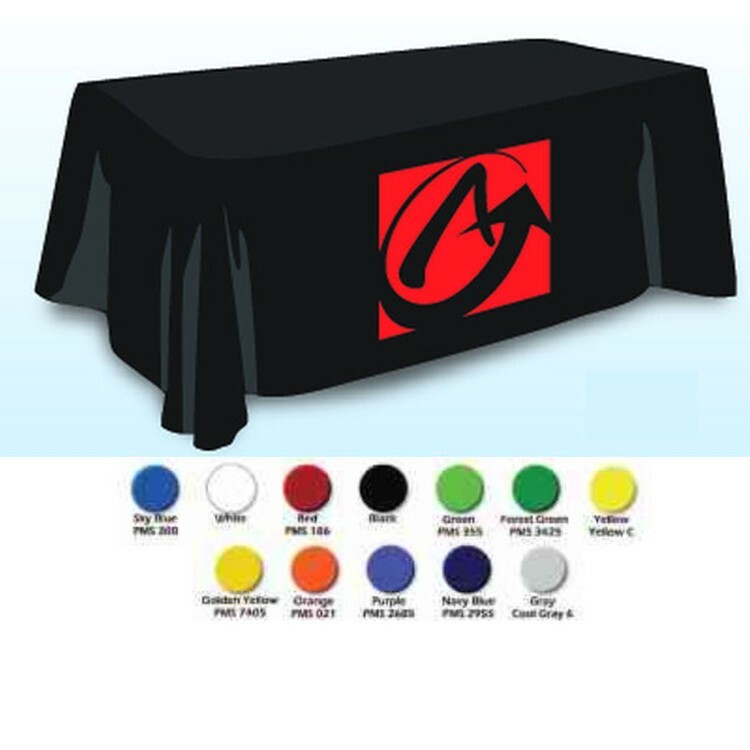 These tablecloths are seamless (made from a single piece of cloth) and are made of 100% woven polyester.Our Nexis Round Table cloths are perfect for restaurant, cafes, events, tradeshows and much more. 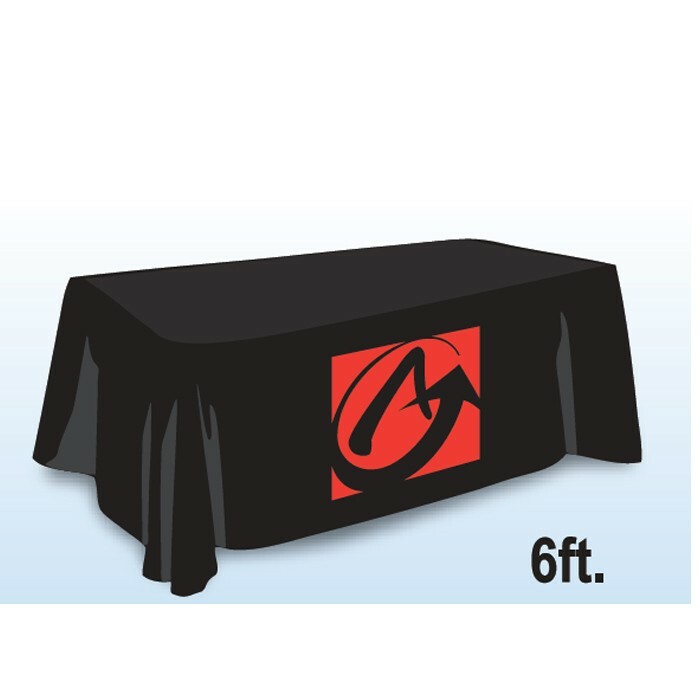 6 Ft. Flat Table Cloth. We use only the finest quality materials for our tablecloths. 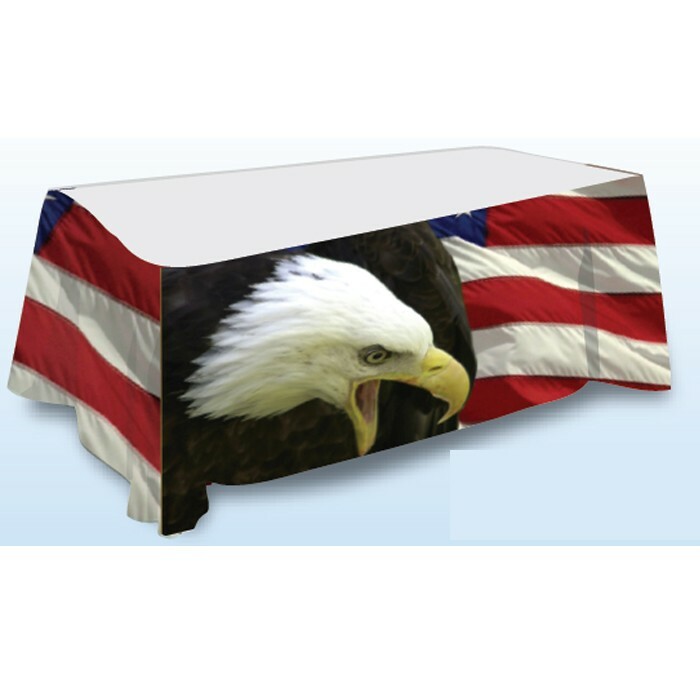 We offer both fitted and throw style tablecloths. We also the largest variety of standard colors. Call today we can help! 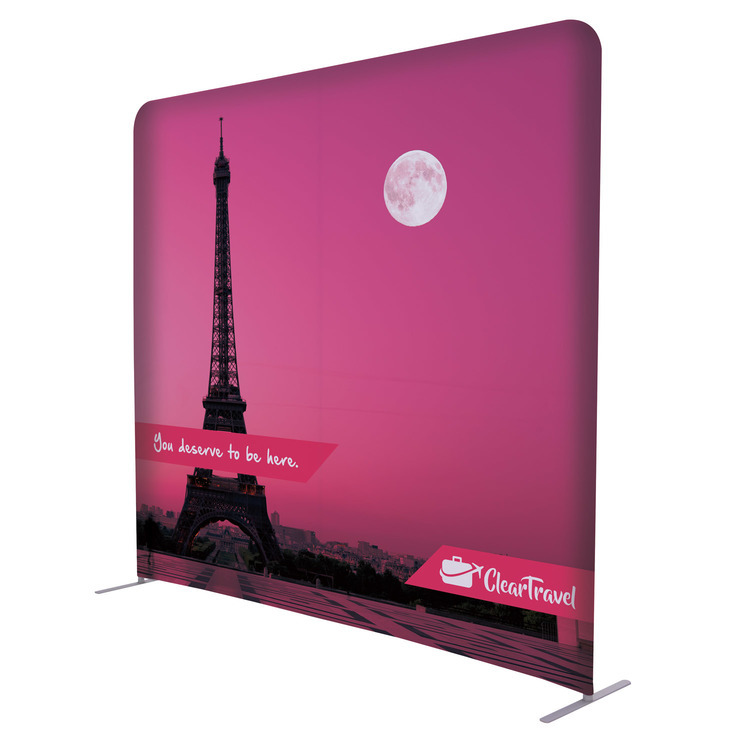 6Ft Standard Table Throw - Front Imprint. 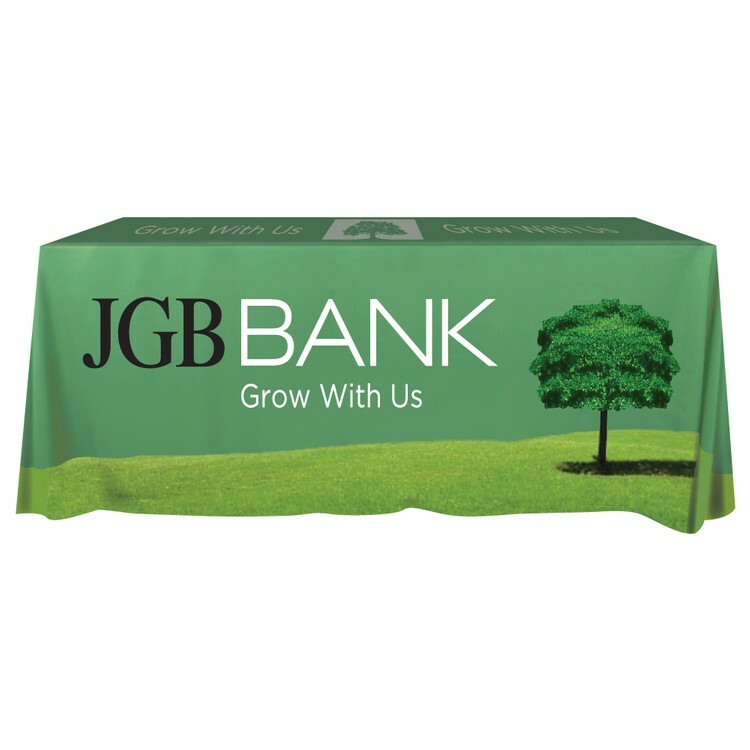 We use only the finest quality materials for our tablecloths. 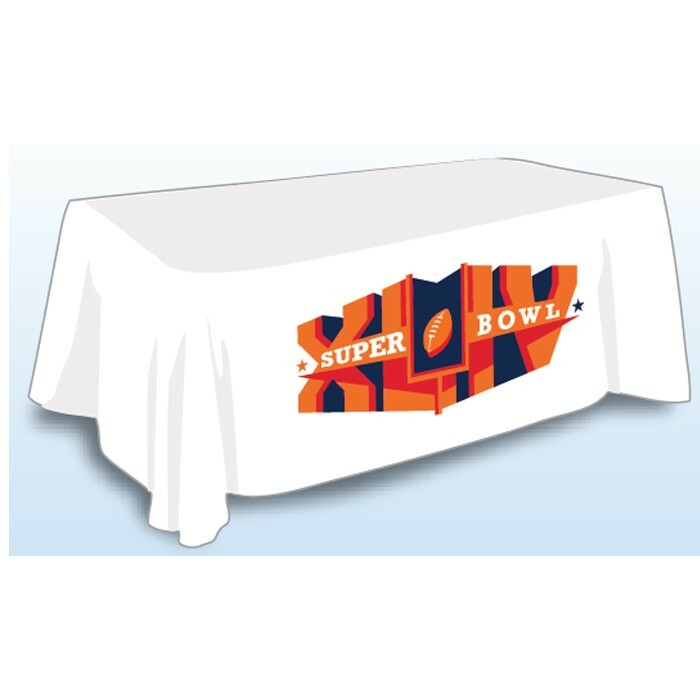 We offer both fitted and throw style tablecloths. We also the largest variety of standard colors. Call today we can help! 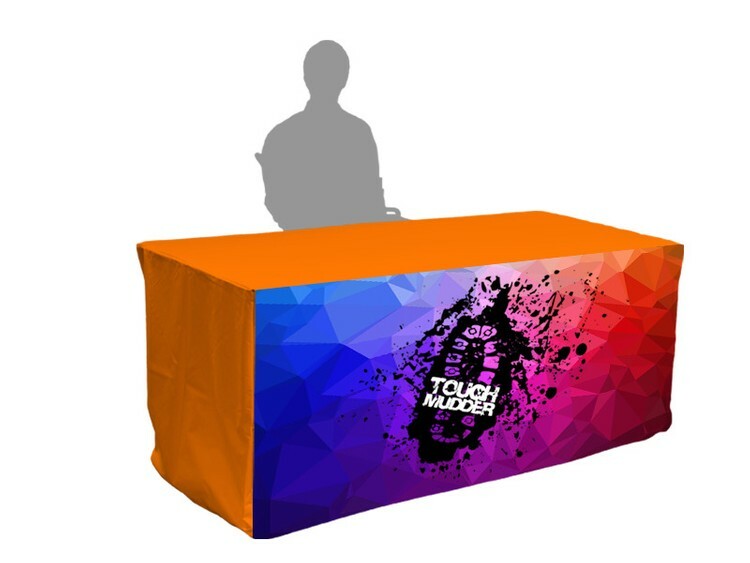 Our All Over Full Color Dye Sublimation Table Covers feature a full color sublimation imprint that covers the entire table cover with a full bleed imprint (exact PMS color matches are not possible, but we will come as close as possible). They are 3-sided with all 3 sides dropping to within 1” above the floor, and the backside is open. They are made from high quality polyester fabric which is wrinkle resistant (no ironing or dry cleaning required) and machine washable in cold water on gentle cycle (tumble dry on low cycle). They are packaged in a high quality Clear Zipper Bag. 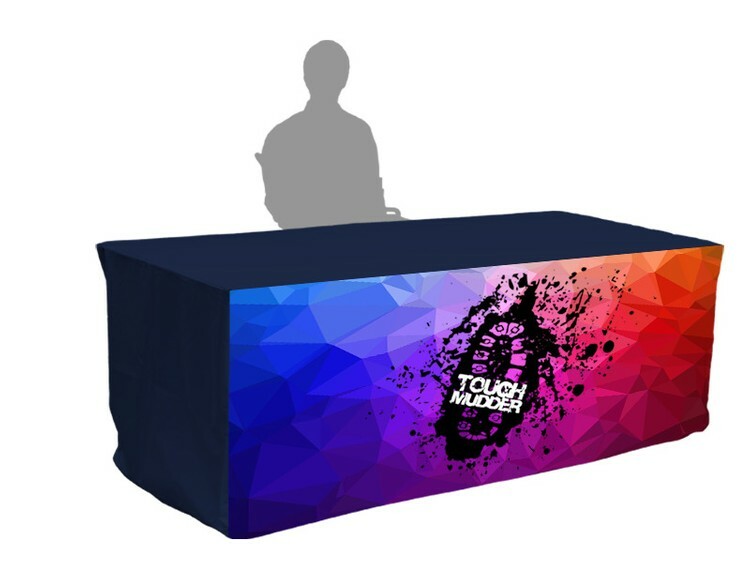 Perfect for Trade Shows, Conventions, Conferences and Meetings 3 sided drops cover the front and sides of table but back is partially open. Made From Premium Weight 300D Polyester Fabric. (No Ironing or dry cleaning required, machine washable) Plush extra thick tear resistant material. Rounded corners prevent bunching hemmed finished edges prevent fraying. 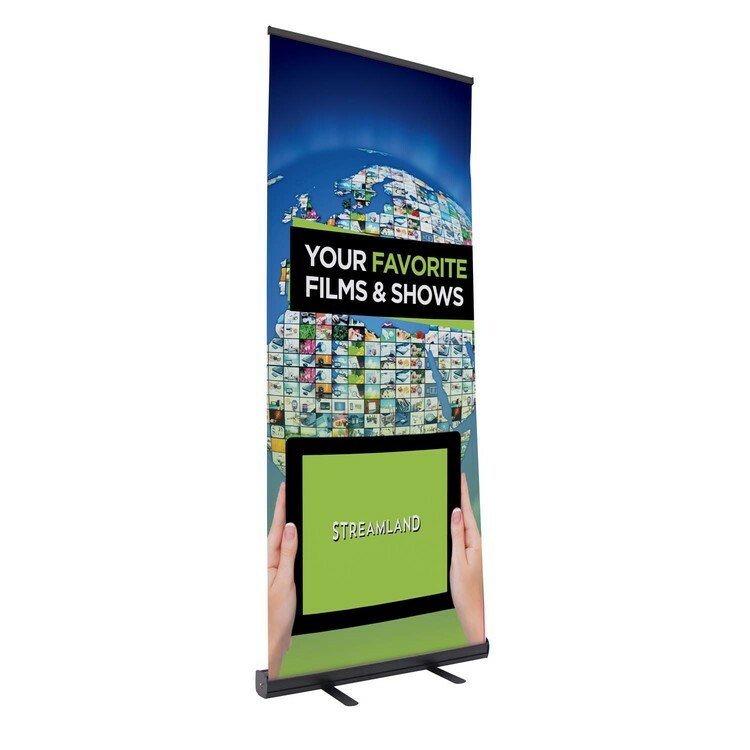 Perfect for Trade Shows, Conventions, Conferences and Meetings Made From Premium Weight 340D Polyester Fabric. 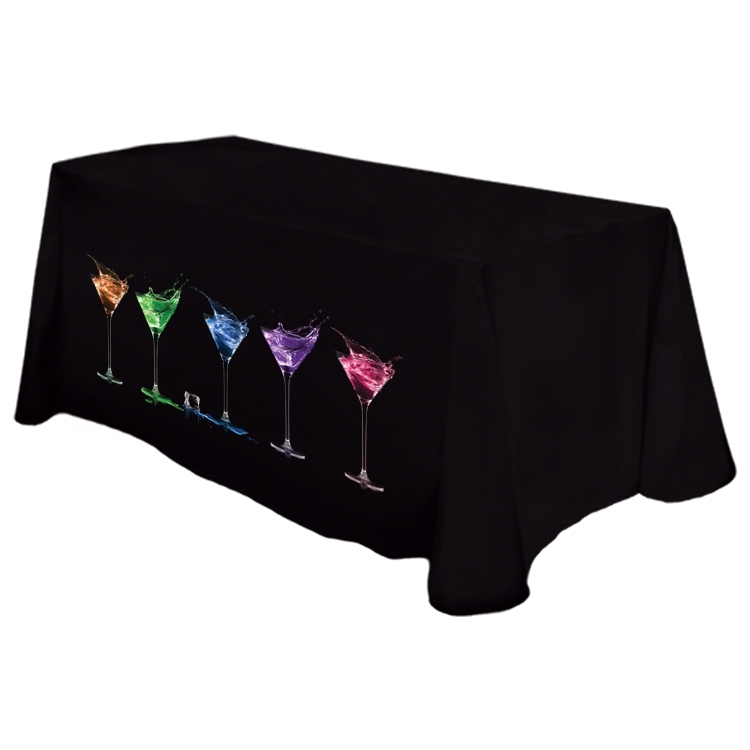 (No ironing or dry cleaning required, machine washable) 4 sided drops cover the entire table to 1 above the floor. Plush extra thick tear resistant material. Rounded corners prevent bunching and hemmed finished edges prevent fraying. TCBB - 23" Long x 5" Dia. Blank black carrying bag available at $25.00(C). MIN QTY 1 - MAX QTY 11 Low Priced Image for the budget conscious customer with simple logos and copy. 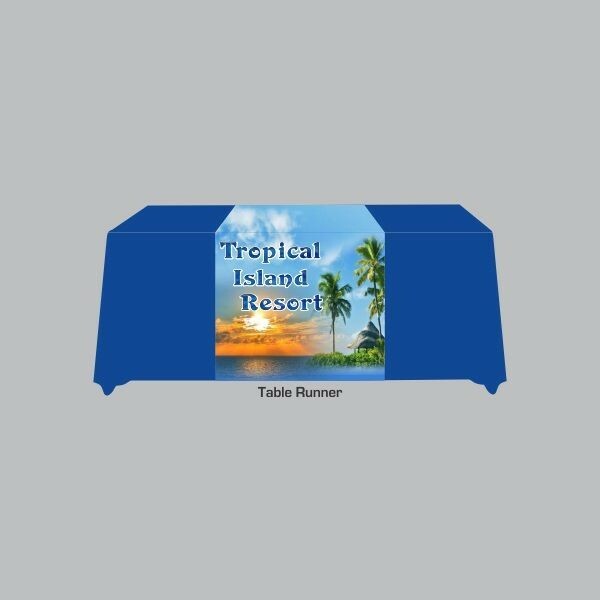 Our same great quality table covers with an economical image process. 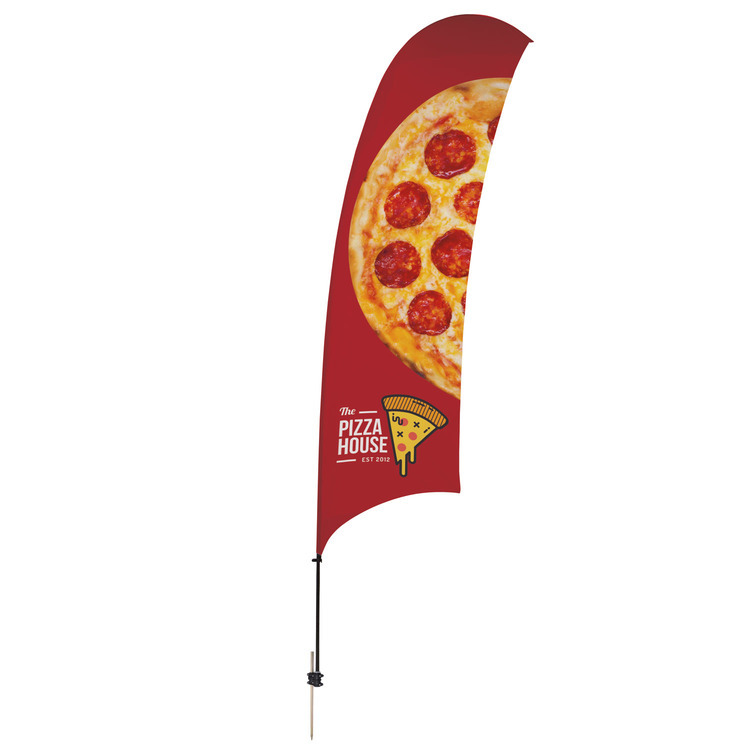 • 100% Polyester Textile • 17" Height image limitation / Up to 72" Width. • High quality logo reproduction. • 12 images colors available for your imprint. 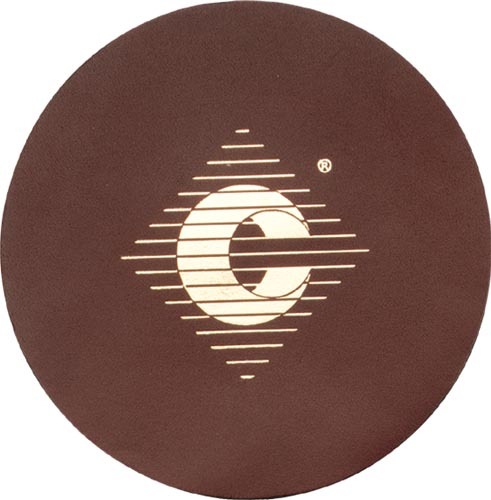 Imprint Area: 17"H x 72"W Construction: • Thermal Heat set urethane image on the front panel. • Choose from 74 stock cloth colors. • Finished with rounded corners. • Drops to the floor on all four sides without bunching. • Sewn with merrowed edges. 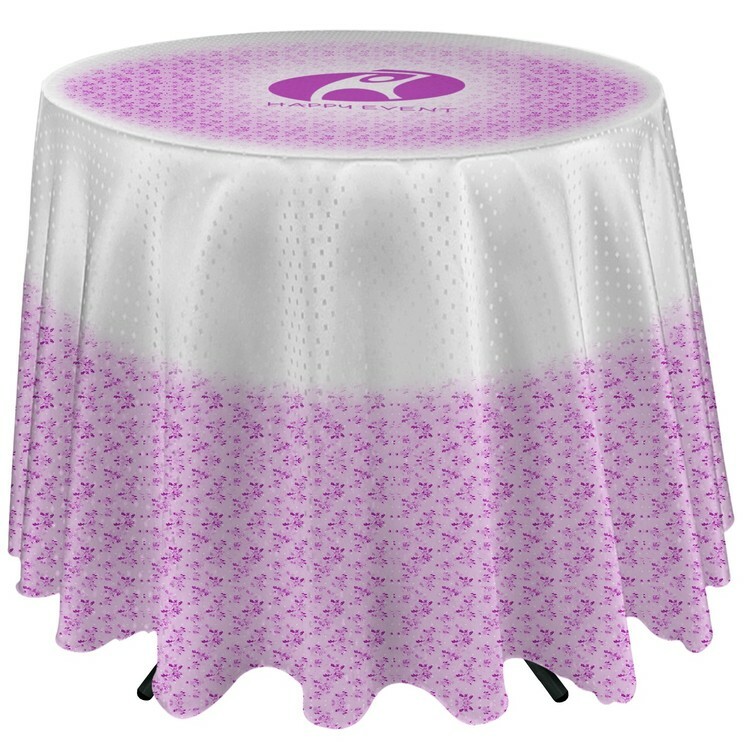 Tablecover Tablecloth Table Runner Table Skirt Red 2 Color. 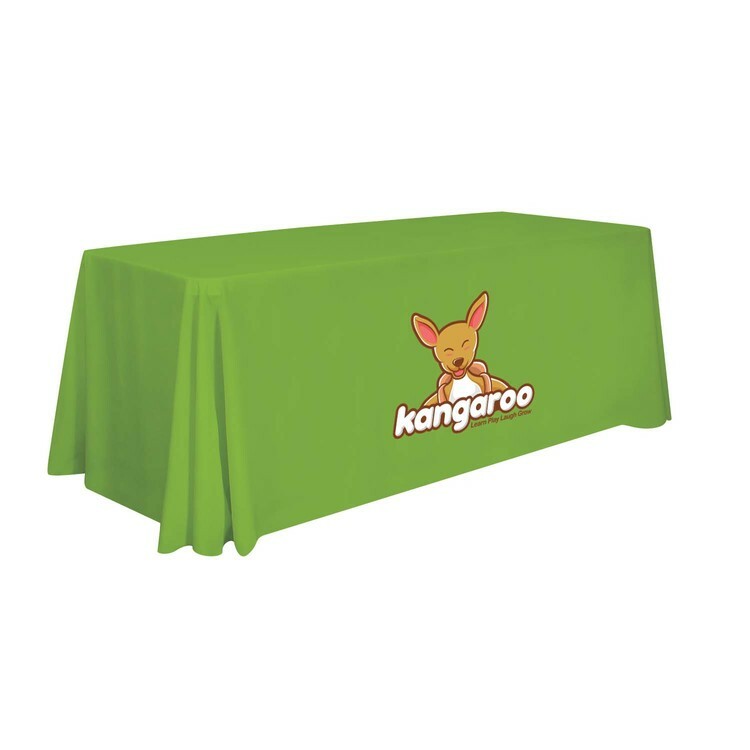 We use only the finest quality materials for our tablecloths. 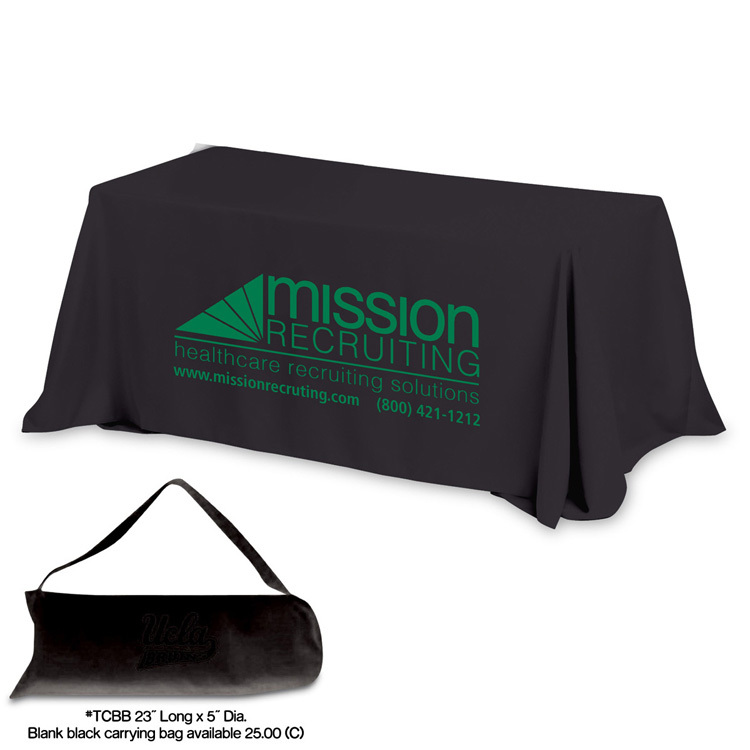 We offer both fitted and throw style tablecloths. We also the largest variety of standard colors. Call today we can help! 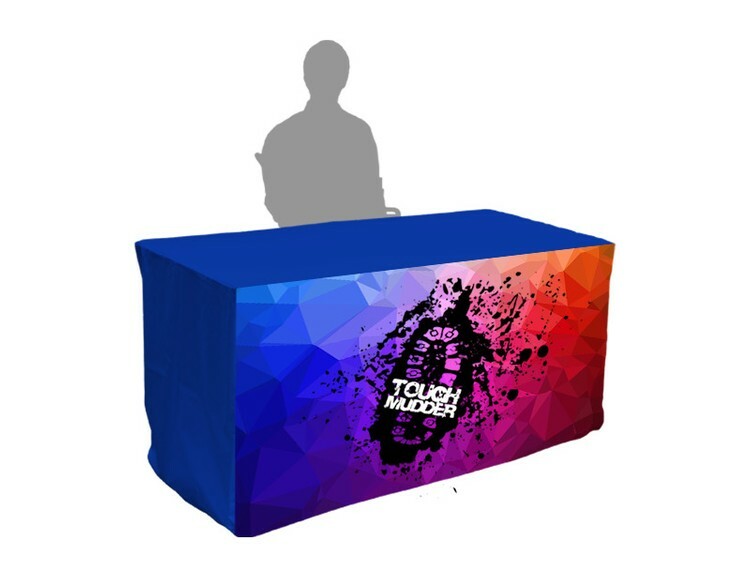 Digital Dye-Sub Table Cover - 6 Foot. 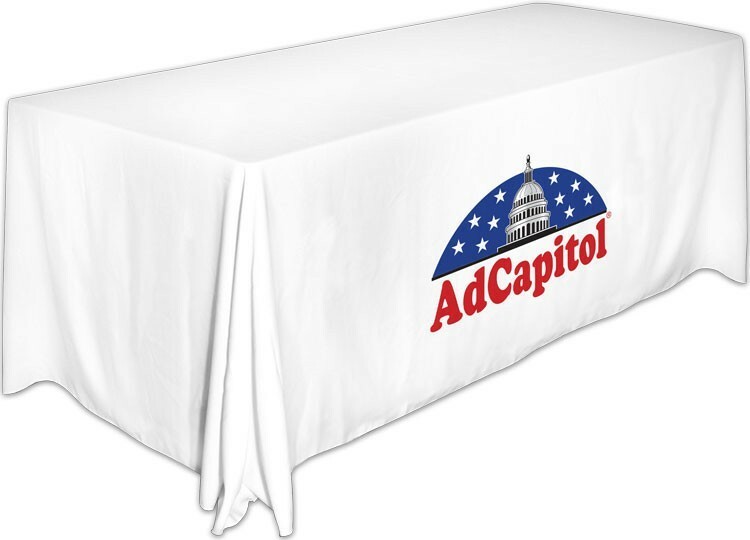 We use only the finest quality materials for our tablecloths. 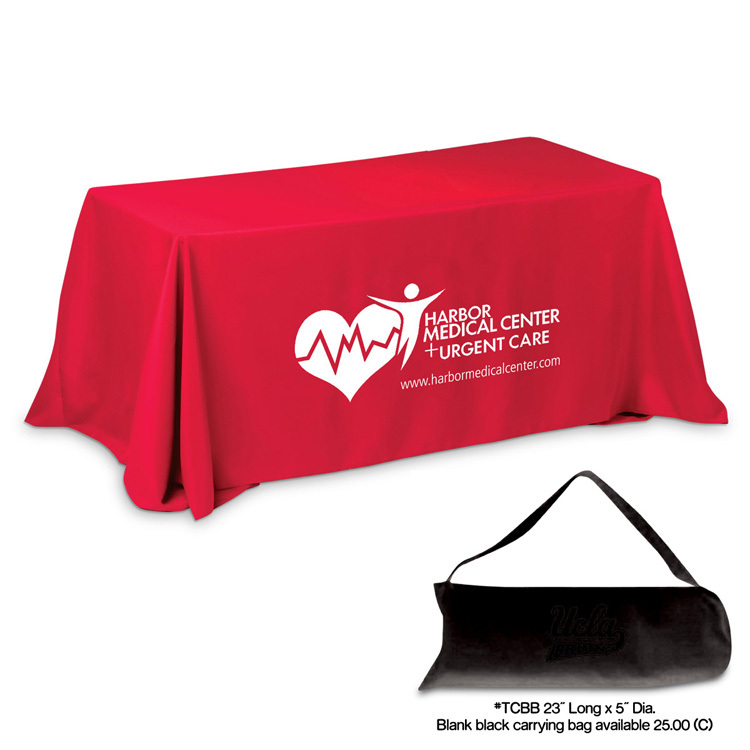 We offer both fitted and throw style tablecloths. We also the largest variety of standard colors. Call today we can help! 6'' Screen-Printed Table Throw. We use only the finest quality materials for our tablecloths. 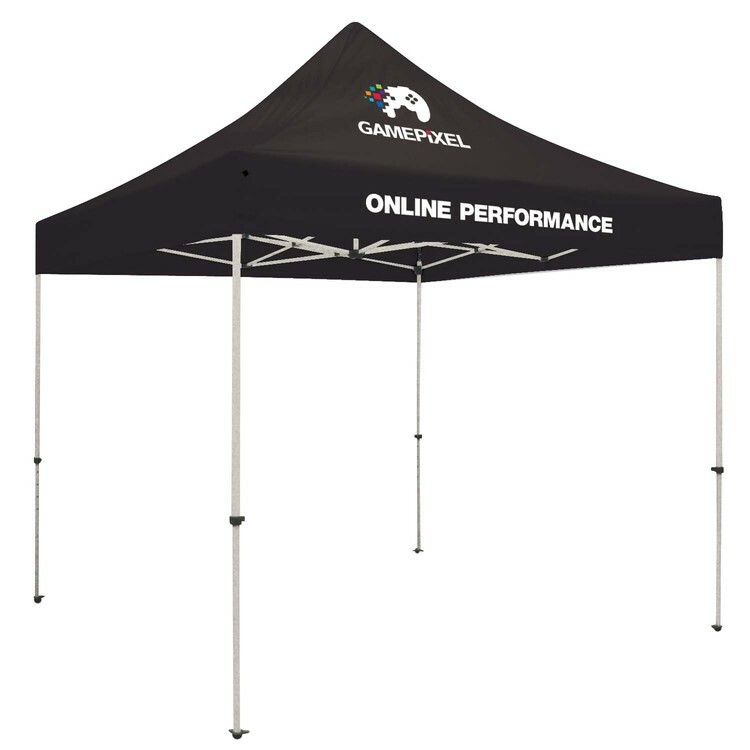 We offer both fitted and throw style tablecloths. We also the largest variety of standard colors. Call today we can help! Table Runner. We use only the finest quality materials for our tablecloths. 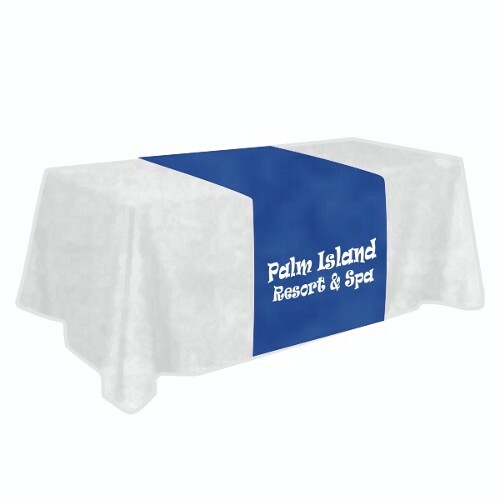 We offer both fitted and throw style tablecloths. We also the largest variety of standard colors. Call today we can help!